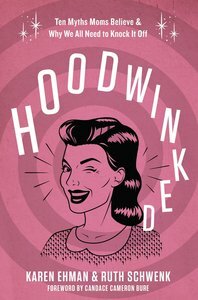 In Hoodwinked, Karen Ehman and Ruth Schwenk offer moms advice and "we've been there" encouragement as they tackle the challenges they face due to myths they believe. Myths such as "I am doing it the right and only way" put up fences between moms who may tackle mothering a little differently instead of building bridges of encouragement between them. Lies such as "I am my child's choices" tempt moms to wrongly believe that if their child makes a bad choice then they must be a bad mom. A six-session video Bible study is also available.